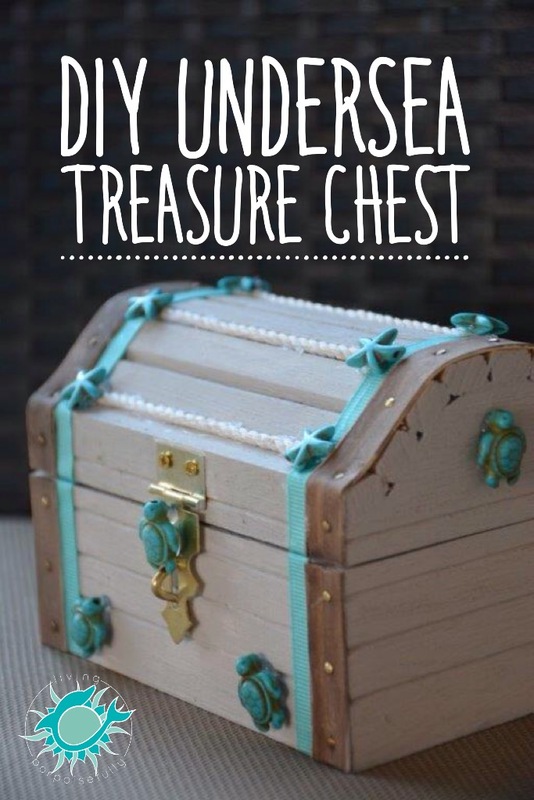 Kids LOVE a place to put their treasures, and this undersea treasure chest is the ultimate safekeeping fantasy. We’ve been having the most fun DIY adventures lately! A close friend asked us for ideas for a fundraising event: a silent auction of an assortment of fun-filled baskets. She wanted it to be ocean themed, so of course, we were joyfully ecstatic to create something special! For the star of the ocean themed basket, we made an Undersea Treasure Chest…perfect for a kid to keep their treasures in, while decorating their room in an undersea theme too. Now, we don’t want just one lucky kid out there to have something so cool to keep their treasures in, so here’s the DIY “how-to” so that you can make one too! It would be a FIN-tastic ocean themed party idea (to give as a favor or as a craft for kids to make at the party), or as a gift for a special child. Enjoy the DIY adventure and stay tuned for the rest of the basket contents (scroll to the bottom for a sneak peek). With Easter approaching, the basket makes for the ultimate ocean lover’s Easter basket too! Paint the treasure chest (except for the bands on either side) with gray chalky paint. Once the paint is dry, cut ribbon to fit next to the bands on each side and glue it down with tacky glue or hot glue. Cut pieces of thin rope the length of the treasure chest (as many as you want), and glue each piece down with hot glue. Add the gleaming gems inside to top off the treasure chest! How fun is that? With accents in cool ocean aqua and turquoise, along with starfish and sea turtles, it’s the perfect DIY decor for a kid’s ocean room. Stay tuned for the other fun projects and the full basket details, coming soon. How creative! Everyone loves to have a special place for their treasures! Can’t wait to see the rest of the basket.